We recently held a little reader survey asking what kind of Techy Tutorials might be helpful to you. 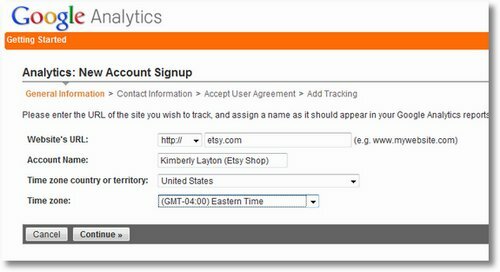 The winning subject was Etsy Shop Analytics, how to track them and how to use them. Setting-up the analytics is easy, so we’ll start with that. Tracking and using the information is a bit more challenging, but we’re going to cover it in detail in upcoming posts. If you want to be sure not to miss any of the posts, subscribe to Everything Etsy by email, click here. If you don’t have an existing Google Analytics account, go here. (will open in a new window)You can sign in with an existing Google Account, or start a new one. Aside: Having a “main” Google account can be very helpful when you work online because it’s easy to access all of your Google products from one place. I use Gmail, Feedburner, AdSense, AdWords, Analytics, and Google Docs regularly and can get to all of them from one screen. If you already have an Analytics account, you’ll usually go to the “Overview: all accounts” screen when you access Analytics. In the orange bar at the top of the screen, there is a drop-down menu which lists all of your accounts. At the bottom is an option for “create new account”. Here’s where we’ll mess-up the people who are just looking at the pictures… I made a smallish error in the picture below. Where is says Website’s URL – enter www.etsy.com – In the picture I left out the www – might not matter, but it can matter sometimes. I went back and changed it. The URL for the main Etsy site includes the WWW. Do NOT put your direct shop link here. Only the main URL for etsy. You’ll only get stats for your shop. Don’t worry. Where it asks for an account name, the official Etsy instructions say to use this format: yourshop.etsy.com, but it really is only for your reference in Analytics and you can use whatever you want. Enter your name on the next screen. Copy the section of the code that is highlighted in the picture. If you don’t feel like getting it here, it’s all by itself on the next screen. Either way, you need that bit of numbers and letter that starts with UA. 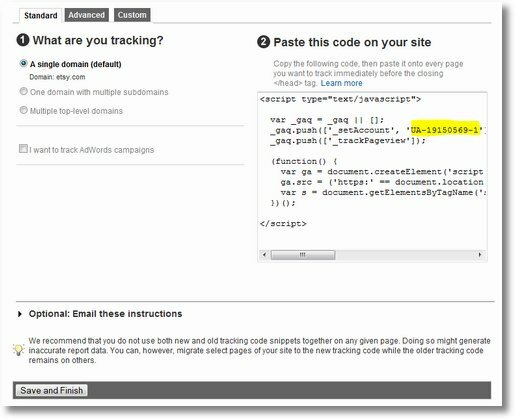 Make sure not to select the single quotation marks on either side of the Tracking ID. Log-in to “your etsy” and find the “Options” link in the left column under the heading “Shop Settings”. Click on that and find the tab at the top to select “Web Analytics”. Enter the tracking ID in the box labeled “Web Property ID”, and hit save. That’s it. You’ve set-up Google Analytics on your Etsy Shop. 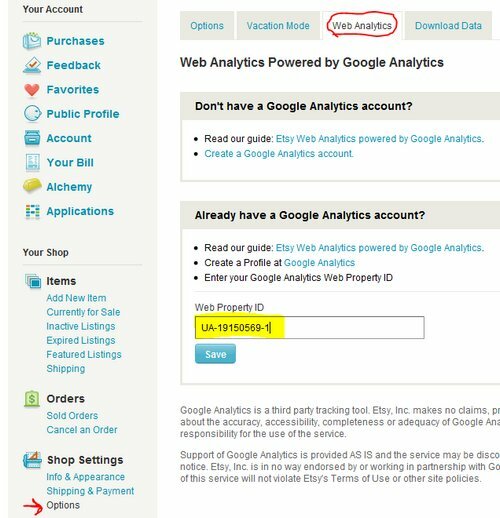 You can access it at any time through your Google Account, or by visiting www.google.com/analytics and logging-in there. Important: Your account won’t start updating immediately. GA updates once per day, so sit-tight and check back in a day or two. The data gets more useful over time, so don’t worry about it much for awhile. In upcoming posts, we’ll get into detail on the data and information you’ll get from doing this and how you can use that. If you want to be sure not to miss any of this, sign-up to get our posts by email. 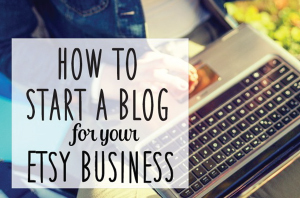 I’d also suggest signing-up at Etsypreneur.com and joining the Website & Blog Techy Stuff Group. I love Google Analytic for my Etsy shop. It is much fun to be able to check out how my shop is doing in the wide world web. .-= CaseyMarie´s last blog ..Vintage Hollywood Film Co Reel To Reel Film Winder =-. .-= Jayne´s last blog ..Steampunk butterfly and vintage watch gears necklace =-. Brilliant! This was exactly what I needed. I tried setting up Analytics a while ago and did it all wrong. I was too “busy” to fix it, but this works. Thank you!!! .-= Kelly Irene´s last blog ..Im a WINNER! =-. Thanks so much for this…I was trying to figure out what you meant about peak times for my items,,,now i understand…I will figure it out…yes I will!!! Wow do I ever feel like a dumbo! I had tried to figure this out yesterday, but TOTALLY did it wrong. Thank you so much for your helpful website. I only have a little bit of time while my young children are sleeping to work on my etsy shop, so I have to make every minute count. I will definitely be checking your site often for more helpful advice. Thank you so much. I have been trying to figure this out on my own and was WAY OFF! 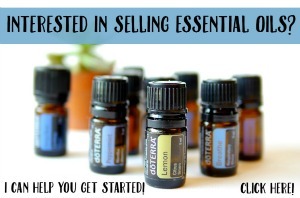 This made it so simple, I can’t believe how easy it actually is! I just needed someone to break it down I guess. .-= Lauren´s last blog ..Shooting Star – Dangling Earrings and Necklace Set =-. Next Post Organize Those Craft Supplies!